Forgetfulness and foggy thoughts are all-too-real issues for some mesothelioma survivors. Despite its name, “chemo brain” doesn’t only affect cancer patients undergoing chemotherapy. The term refers to thinking and memory problems which can occur before, during and after treatment. Dr. David Sugarbaker explains the affects of chemo brain. Chemo brain is a common symptom reported by many cancer patients. Doctors and researchers call the condition many things, including chemo fog, chemotherapy-related cognitive impairment, cognitive dysfunction and post-chemotherapy cognitive impairment. Cancer patients have referred to mental symptoms and side effects as chemo brain for decades, but it wasn’t until the late 1990s that doctors began paying attention to the condition. The exact cause is unknown, but researchers are striving to better understand chemo brain, including which patients have the highest risk of developing the condition and effective treatment approaches to maintain brain health. Dr. Jeffrey Wefel, a board-certified neuropsychologist and associate professor at MD Anderson, is currently leading a study to demonstrate that older breast cancer patients receiving chemotherapy more frequently develop cognitive impairment. The study also aims to identify possible biomarkers to better understand who is at risk and use magnetic resonance imaging (MRI) to learn how the brain processes certain images. Mesothelioma patients should tell their doctor if they experience any changes to their ability to think clearly or remember things. Chemo brain is a diagnosable condition, and evaluations are considered medical procedures — not a mental health benefit — meaning they are covered by most health insurance plans. Chemo brain can refer to various forms of cognitive dysfunction, or the loss of intellectual functions such as thinking, remembering and reasoning. These mental changes may be mild to severe and can happen at any time when you have cancer. Chemo brain can have a direct and sometimes lasting impact on a patient’s life. Depending on the severity of the symptoms, people may be unable to return to school, work or social activities. These symptoms can negatively affect a mesothelioma patient’s quality of life. For example, confusing dates can lead to missed doctors’ appointments, and a general fogginess may inhibit conveying important details about your health to your oncologist. 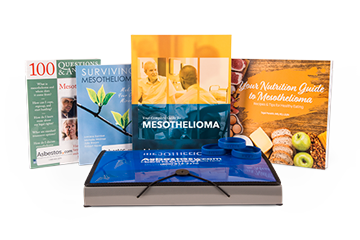 Information, books, wristbands and more for mesothelioma patients and caregivers delivered over night. How Long Does Chemo Brain Last? Chemo brain may last a short time or go on for years. It all depends on the patient and how their body responds to cancer and treatment. For example, symptoms may fade for some patients after chemotherapy ends, while it may take others a year or more to feel normal again. Brain symptoms can also start and even get worse after treatment is over. Other patients may notice signs before chemotherapy treatment begins. Studies suggest most symptoms related to chemo brain are short-term problems and improve as the underlying problem is treated or goes away — such as stopping chemotherapy treatment. However, there have been cases where patients never fully regain mental ability. Before the late 1990s, chemo brain was a term only members of the cancer community worried about or even joked about. Research has since confirmed the condition is real, but there is still much to learn regarding the causes and risk factors of chemo brain. According to Wefel, cancer can disrupt systems in the body that end up affecting cognitive function. Additionally, cancer treatments — including certain forms of chemotherapy, immunotherapy, radiation therapy and surgery — can directly or indirectly disrupt, damage or alter normal brain function. Research shows some patients may have genetic susceptibility to chemo brain or be more sensitive to certain cancer treatments such as chemotherapy. Emotional reactions to a cancer diagnosis and treatment can cause long-lasting brain problems unless treated. While sharing some characteristics with other diagnoses that can affect mental function, chemo brain should not be confused with Alzheimer’s disease (dementia), anxiety or depression. Doctors are working to better pinpoint risk factors of memory problems in mesothelioma survivors. Age can be a significant risk factor, since most mesothelioma patients are diagnosed at age 65 or older. Our patient advocate team listens to your questions and concerns and will provide you with answers at no cost to you or your family. Doctors and researchers still aren’t sure what exactly causes chemo brain. No cure has been identified, and no standard treatment exists. There is also no way to prevent the condition. Since most cancer-related memory problems are mild and temporary, treatment plans generally focus on coping with symptoms. There are several things mesothelioma survivors can do to help sharpen their mind and manage chemo brain symptoms. Patients are encouraged to keep a journal documenting signs and symptoms of mental cloudiness to share with their doctor. This helps the doctor understand how the mental problems are affecting your everyday life. A journal can also help jog your memory of recent events, while keeping a daily planner can help you keep track of appointments, to-do lists and other important information such as phone numbers and meeting notes. A voice recorder may also come in handy. Exercising Your Brain: Simple memory training such as flash cards, word puzzles and sequencing games can help patients stay sharp. Digital brain-training programs are growing in popularity as well. In 2018, the National Cancer Institute recognized a website called BrainHQ as a research-tested intervention for chemo brain. Also consider learning something new such as a foreign language. Getting Enough Sleep: Sleep is essential for optimal brain function and allows the body to relax and recharge. Inadequate sleep and rest can worsen chemo brain symptoms.Take short naps during the day if you feel tired. Minimizing Distractions: Difficulty focusing on a single activity or task is one of the most common symptoms of chemo brain. Changing your environment — such as relocating to a soundproof room or office — can decrease distractions and improve concentration at home and in the workplace. The American Cancer Society suggests avoiding multitasking in order to devote full attention to one thing at a time. Following Routines: Organization is important when facing memory problems. Having a daily routine or keeping a daily schedule can help you focus and stay on track. Try picking a place for commonly lost objects such as keys and medications, and put them there each time. A journal or planner can help you remember where things go. Exercising Daily: In addition to working out your brain with memory and strategy games, regular physical activity can improve mental function. Even five to 10 minutes of mild to moderate exercise daily can reduce fatigue and stress, improve your mood and make you feel more alert. Asking for Help: Don’t be afraid to ask for the help of family and friends. Loved ones can help you remember daily tasks and minimize distractions to save you mental energy. Eating Well: Studies show a healthy diet packed with so-called superfoods can benefit cognitive function. Foods such as wild salmon, blueberries, kimchi, asparagus and eggs can all increase brain power. Laughing It Off: Don’t let symptoms of chemo brain get the best of you. Stressing over the problems can make the situation worse. Be honest with yourself and make appropriate changes to help jog your memory and adjust your lifestyle. Keeping a positive attitude and laughing about things you can’t control can help you cope. In addition to cognitive strategies and healthy lifestyle changes, some patients may find relief from certain stimulants. Medications such as Concerta and Ritalin are used to treat attention-deficity/hyperactivity disorder (ADHD) by improving mental focus, concentration and stamina. Marketed under the brand name Aricept, donepezil is used to improve cognition and behavior of people with Alzheimer’s disease. This stimulant can treat narcolepsy, sleep apnea and shift work sleep disorder. Common brands include Provigil. Supplements such as ginkgo and vitamin E have shown promise in improving brain health and memory problems. Mesothelioma patients should always discuss potential risks and benefits with their doctor before taking any medications or alternative treatments. MD Anderson Cancer Center. (n.d.). Chemobrain. Raeke, M. (2017, March 1). Cancer treatment side effect: Chemobrain. MD Anderson Cancer Center. (2013, May 14). Multimodal MRI Biomarker of Mild Cognitive Impairment in Breast Cancer. Mayo Clinic. (2017, August 17). Chemo brain. American Cancer Society. (2017, June). Getting Help for Chemo Brain. American Cancer Society. (2016, June 9). Chemo Brain. Perlmutter, D. (2015, October 2). 20 Foods To Naturally Increase Your Brain Power. Cancer Treatment Centers of America. (n.d.). Addressing sleep problems in cancer patients.